Dating as far back as medieval times, the necessity to protect ones possessions was of paramount importance. Due to the state of society being less-civilized than the relatively safe environment which we enjoy today; iron window grills and guards, as well as fences and entry gates, were employed in various forms. Originally they were fabricated mostly of wrought iron, and the design was dependent on the architectural style as well as the worth of the home and it's contents. Elements were added depending what was affordable by the homeowner, included sharp spikes, threatening-looking finials, and scary figures such as gargoyles that were designed to look menacing and make entry less-attractive and more difficult for an intruder to manage. Simplistic, more crude designs with an emphasis on strength, were fabricated in less-ornate examples, to provide every homeowner the up most protection; necessary for exposed openings in residences located close to the street. Another example, was the shutter guard. which was a primitive and simple design, possessed strength and were often used as an effective alternative to more elaborate products, for deterring a criminal from entering. Man in his inventiveness, however much he tried to focus on what is of a practical or useful nature, has always been possessed and inspired by the spirit to beautify objects that once only needed to function. Under his eye and hand, an artist was born, once the useful purpose of the object was achieved. Then the need to decorate and make things less crude in appearance and character, became the object of his thoughts and what inspired him. In addition, adding ornamental elements could also enhance the useful properties; and even create a more perfect piece.This does not mean that products that were originally fabricated to be useful and necessary; that are without embellishment of any sort, are not beautiful simply for their qualities of construction and practicality. The beauty can be seen in the process, by which shapes and objects necessary for everyday life; are manufactured...as well as in the works created by that process. 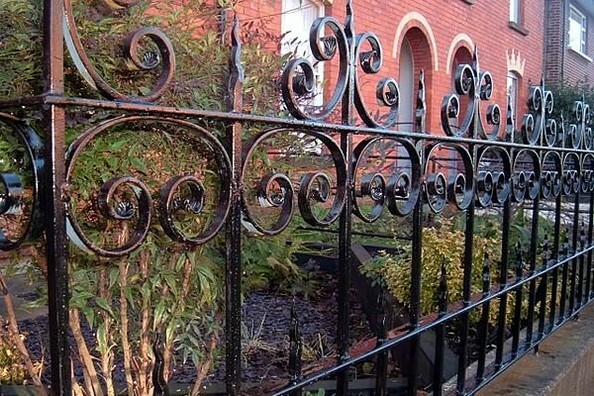 It is evident through retrospectively studying and researching how wrought iron evolved as a material, that the artist and artisan benefit from using the acquired knowledge and experience of those who came before him and who cultivated the art and science of blacksmithing. These pioneers experimented with the limits of the metal itself, and solved the problems associated with shaping it by determining it's strength, malleability and ductility; in order to create the forms useful for weapons, tools, objects for the home, and agricultural implements. Out of old forms, his imagination and inventiveness created new ones, better suited towards the needs of the time and requirements for different architectural styles, construction and domestic uses.In observing the medieval wrought iron items fabricated by blacksmiths descending from nations such as Germany, Switzerland & Norway, one can't help but notice; that these early designs were of patterns and shapes that reflected their understanding of the characteristics and properties of wrought iron. Their designs suggest an understanding and a respect for wrought iron's intended purpose as a metal, indicated by the fact that they did not overwrought or work it into things that were better-suited for other craftsman to render. This seems to indicate that they realized the value of not compromising it's usefulness. It is evident today that when we consider creating items such as iron grilles as sensible protection against crime, that we not go beyond the metal's province. It can contain ornamental elements, however; we must draw a distinction in how much we should embellish a wrought iron design with realistic looking leaves, flowers, and other decorative forms.